I just got my new Zeo sleep monitor system. I was excited to order it for a couple of reasons — the main one is that I sleep horribly — have my whole life. I tend to wake up several times a night and then I toss & turn a lot. It’s some mix of mild apnea and some insomnia — it’s something I’ve always lived with, but am feeling stressed enough about that I’m more actively working to make it better now. The second reason I’m excited about it is because I’m really interested in the rise of personal sensors. I think we’re at the very beginning of a long boom of “normal” people using sensors they buy retail to track a whole variety of characteristics about themselves. I’ve been using Nike+ with my Nano to run for several years, and it absolutely changes my behavior because I’m measuring it. Devices like the Zeo and the FitBit are early in the wave. I’ll post more about the system when I have some time — it’s a full system at this point — sensor, info collector (the alarm clock), cloud storage (where you upload your data), and web interface to information, coaching, etc. (plus daily coaching e-mails based on a few factors). For now, though, just wanted to share a graph of last night’s sleep (above). Turns out I got a good amount of deep sleep & REM sleep, which are both important — but it wasn’t very efficient sleep, as I spent much of the night in light sleep (and wake, which I think is underrepresented on the graph). Had been thinking about getting one too. Also love the ideas of personal sensors. I like the feedback loop that it provides — esp. for exercise. Keeps one motivated. Looking forward to seeing your review of it over time and if its worth the trouble/investment in the mid-long term as the geek-factor wares out. Hi John – Glad to see the great start. 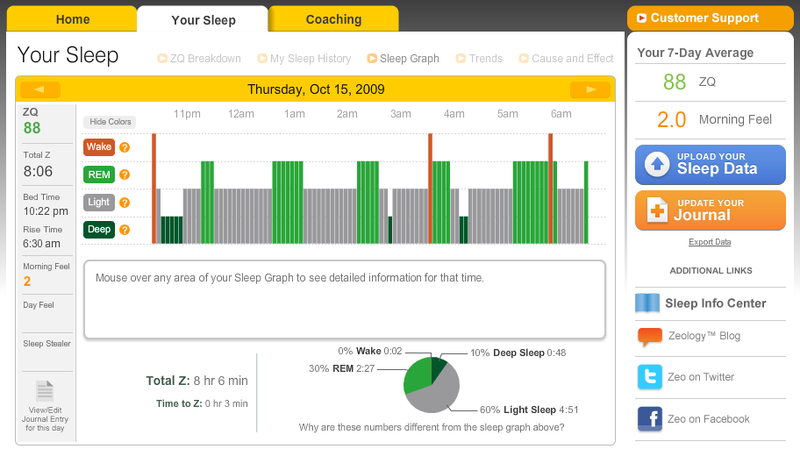 FYI, there’s also a sleep wheel in the box with Zeo that allows you to compare your sleep with others’ your age. It looks like you’re ahead of the curve already. Let us know if you have any questions/concerns along the way (via traditional customer support, or on twitter or Facebook). First of all, appologies for using your blog to contact you. Hopefully you don’t mind. I am a MSc in Management student on Edinburgh University in Scotland. My group and I decided to use Mozilla as a topic of our Organizational behaviour course assignment. Since we all watched (on a DVD) your 2008. appearance on Stanford executive meeting, we were intrigued with the chaordic model of management you mentioned. Therefore, we would like to ask you a few questions about the practical use of the montioned model, and about the culture that exists both within Mozilla and towards all those people who are volunteering to make Mozilla the best web browser. Please contact me on the e-mail address I provided. Sounds like you sleep about as well as I do these days (except when its worse). How are your feelings about the quality of the Zeo as a whole? I’ve considered things like it but wasn’t sure how useful they are for gathering accurate data. If you haven’t done so already, see a sleep specialist and get tested. I’m sure the folks at Zeo would say the same thing. Yep, for sure. I’m not using this as a substitute for medical care — really is in addition to, and as a bit of an every day reminder on habits & behaviors. Sleep studies themselves (I’ve done one; planning to do another) have issues, in that they’re so different, conditions-wise, that they perturb your sleep significantly, which is the very thing they’re trying to measure. So something like a Zeo should help to set a baseline for interpreting those results.